No Internet access? No worries. With Google's new offline capabilities, you can still be productive in Gmail, Docs and Calendar. Traditionally, if you found yourself without an Internet connection — say at the airport, on a train or in the midst of a hurricane (ahem, Irene) — you were usually out of luck if you wanted to get some work done. But not with Google Apps. Making good on its promise at the Google I/O conference this year, Google is announcing its first steps in bringing offline access to its suite of web-based software. Starting today and continuing through next week, Gmail, Google Calendar and Google Docs will be available offline. 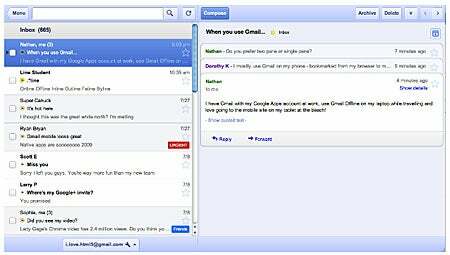 Gmail Offline allows users to read, respond to, search and archive messages without network access. To get it, visit the Chrome Web Store and download the app. This HTML5-powered app is based on the Gmail Web app for tablets, which was built to function with or without Web access. Once you download the Gmail Offline app, you can continue using Gmail even when you lose your Internet connection. Switch to Offline mode by clicking the Gmail Offline icon on Chrome's "new tab" page. After its first start-up, Gmail Offline will automatically synch messages and queued actions anytime Chrome is running and an Internet connection is available. Note that if you use a public or shared computer, you should not enable Offline Gmail. To work offline in Calendar and Docs, click the gear icon at the top right corner of the Web app and select the option for offline access. In Calendar, you'll be able to view events and RSVP to appointments. In Docs offline, you can just view documents and spreadsheets. Google says that offline editing isn't ready just yet, but they're "working hard to make it a reality." Also coming soon is the ability for users to customize the amount of email they wish to synchronize.